See following sections about actual Groonga related projects and details. There are some software used with other database products. You can use extended SQL query. Mroonga is a MySQL storage engine built on Groonga. It adds high performance and high accuracy fulltext search feature to MySQL. textsearch_groonga adds fulltext search feature built on Groonga to PostgreSQL. 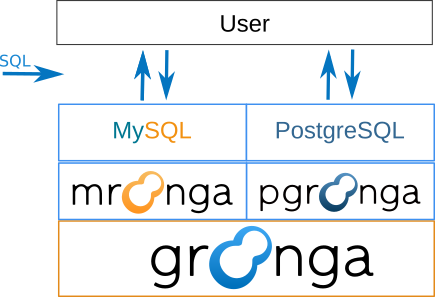 PGroonga is a PostgreSQL extension to use Groonga as the index. You can use fast full text search feature against all languages by installing PGroonga into your PostgreSQL. There are some language bindings for Groonga. You can use Node.js, Ruby and Perl as language bindings which provides HTTP/API access. 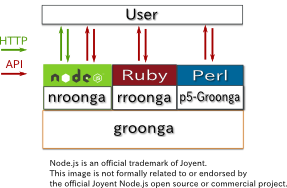 Nroonga is a Groonga binding for Node.js. Nroonga uses Groonga as a library. It means that fulltext search is done in Node.js process. Rroonga is a Ruby bindings for Groonga. Rroonga is a part of The Ranguba project which provides a fulltext search system built on Groonga. GrnMini is Rroonga wrapper for using easily. p5-Groonga is a Perl bindings for Groonga. You can use Groonga as a library in Perl. Ploonga is a Perl bindings for Groonga. You can use Groonga as a library in Perl. Proonga is a PHP bindings for Groonga. You can use Groonga as a library in PHP. Haroonga is a Haskell bindings for Groonga. You can use both Groonga command layer API and low layer API in Haskell. Groonga-GObject is a GObject wrapper of Groonga using GObject Introspection. You can use Groonga as a library in some programming languages. There are some client libraries which provides API to connect to Groonga server in some program languages. The gqtp described in above picture means "groonga query transfer protocol". AnyEvent-Groonga is a high performance Groonga client library for Perl. It accesses Groonga server asynchronously. node-groonga is a client library of Groonga server for Node.js. Node-groonga uses Groonga as a server. It means that fulltext search is done in Groonga server process not Node.js process. Groonga-client is a client library of Groonga server for Ruby. It supports GQTP and HTTP. GQTP gem is a GQTP (Groonga Query Transfer Protocol) Ruby implementation. Gqtp gem provides both GQTP client, GQTP server and GQTP proxy implementations. They provide asynchronous API. You can use gqtp gem for high concurrency use. pyroonga is a client library of Groonga server in Python. It supports GQTP. poyonga is a client library of Groonga server in Python. It supports GQTP and HTTP. groonga-http-php is a clinet library of Groonga server in PHP. It supports HTTP. php-phroonga is a client library of Groonga server in PHP. It supports HTTP. eroonga is a client library of Groonga server. It is implemented by only Erlang. You can connect to Groonga server that uses gqtp. goroo is a client library of Groonga server in Go. It supports HTTP and GQTP. groonga4s is a client library of Groonga server in Scala. It supports HTTP. ruroonga_client is a client library of Groonga server implemented with Rust. It supports HTTP. There are some libraries which provides convenient API or HTTP functionality (reverse proxy) for Groonga server use. App::Groonga::Wrapper is a reverse proxy for local HTTP protocol Groonga server. It adds security mechanism to Groonga server. It is written in Perl. Sewell is a generator for Groonga's query in Ruby. It is useful for both of Groonga server use and Rroonga. There are some utilities which improves CLI (command line interface) for Groonga. grnwrap is a utility that improves Groonga's command line interface. grnline.fs resolves character encoding problem which is contained in Groonga command for non UTF-8 environment Windows, such as using cp932 code page. This tool is implemented with .NET. And it supports reading/writing Groonga databases which are created in Linux, Mac, and other Unix like environment. Grnlip is a CLI for Groonga using Readline. Supports UTF-8 database on Windows. It's written in Ruby and published on RubyGems.org. zsh_completions are Zsh completion functions by hhato. They includes completion functions for Groonga, groonga-suggest-httpd and groonga-suggest-learner.